West Jakarta Library and Archive Sub-dept. will add three mobile library cars in Budget Year 2018.
" 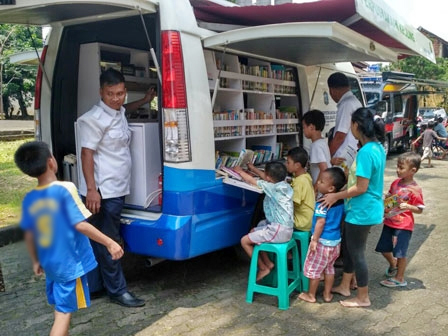 This year we plan to add three mobile library cars"
West Jakarta Library and Archive Sub-dept. Head, Tri Wahyuningdiah mentioned, her side has only seven mobile library cars that operate in eight sub-districts. "Seven mobile library cars are operated to serve children in eight sub-districts every day," she explained, Wednesday (8/1). According to her, at least West Jakarta should have 10-11 mobile library cars to serve its residents. "This year we plan to add three mobile library cars," he conveyed. She expects additional mobile library cars to fulfill residents' reading interest, especially children and students. "We also add more library rooms in government offices, RPTRA, market, puskesmas, and hospital to grow people's interest in reading," she said.